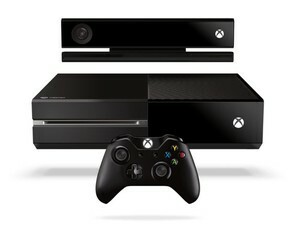 The new Microsoft console: The Xbox One!! Games will be "more immersive, more personal and more connected than ever before" - Phil Spencer. It looks like a VCR. Yes, I know that controller is the first Xbox. And the "console" is a VCR. And the kinect is a regular kinect. And the game box is the first Halo with the word "5" taped onto it. Seriously, what did they think of when they came up with this name?